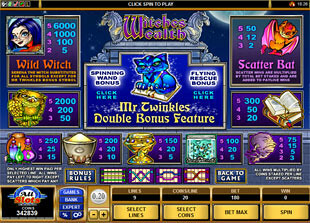 Witches Wealth Slots is terrific video game powered by Microgaming. This 5 reel, 9 line video has prepared for you unbelievable surprises. So get ready for the night stroll along the narrow streets of a little mysterious city where the moon hangs over the ancient towers, where the shadows create fanciful tracery on the walls, where one can meet a witch flying on the broom and picking up the most beautiful stars. So, if you want to spy upon a with and to find out where she hides her wealth, stake on to win Spinning Wand Bonus or Flying Rescue Bonus and to find top jackpot of $30,000. Thanks to the cool design of the game it is really very captivating to follow the mystic symbols spinning here and there: Owl with golden feathers, Magic Books, different Bottles with Poison, Magic Sand, Golden Goblet, Snake Eyes and Witch’s Specter. 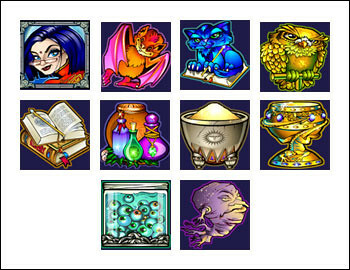 Special game symbols are: Witch, Bat and Mr Twinkles. As this game has various coin denominations, you can vary the stakes according to the amount of money on your current account: $0.01, $0.02, $0.05, $0.10, $0.20, $0.25. Moreover, you can stake up to 20 coins per line. The minimum bet is $0.09, the maximum one is $45.00. The highest witch’s jackpot is 6,000 coins or $30,000 for 5 Witches. The second witch’s jackpot is 2,000 coins or $10,000 for 5 Owls. 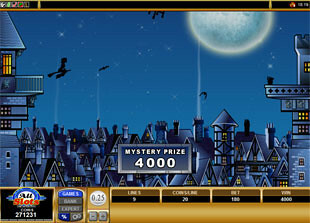 The third witch’s jackpot is 1,000 coins or $5,000 for 4 Witches. The wild symbol of the game is Witch. She flies on the reels to substitute for other symbols except bonus symbol. So, Witch replaces other icons to make the winning combination complete. Wild symbol acts only on the selected lines. The scatter symbol is Bat. This symbol make winning combinations independently on the active lines, that’s why it can be scattered everywhere on the reels. The maximum scatter win is $2,250. Spinning Wand Bonus. This bonus round is activated when 3 or 4 Misters Twinkles appear on one of the active lines. 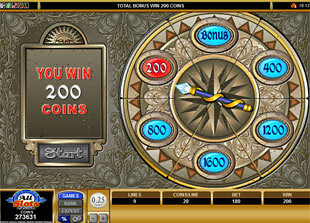 In this bonus game you will need to spin the wand on the magic wheel. You can win up to 1600 coins – $8,000 or to win the entry in the following round. Flying Rescue Bonus. This bonus game is triggered if you win it in the previous round or if you catch 5 Misters Twinkles on one active line. 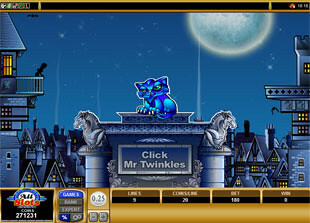 In this exciting game you should click on Mister Twinkles to get your mystery prize. You can win up to 16,200 coins – $81,000. Then you should pay attention to the background where witch will fly from one balcony to another. If she isn’t brought down by the falling objects, your prize will be doubled. Moreover, your prize can be tripled, if she makes successful way home. 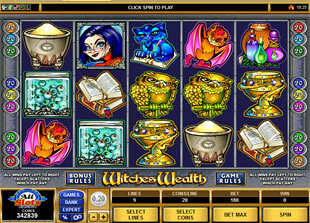 Witches Wealth slot machine is incomparable video game that will surely create an impression on all those who like scary stories about witches and their tricks. So, become the hero of this story and Mister Twinkles will tell you where the witch’s wealth is hidden.